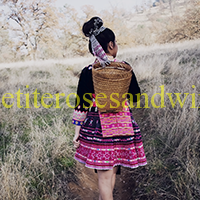 Who did you purchase your Hmong Thai outfit (the last outfit) from? I’ve heard mixed reviews about Usani Muangmao. How was your experience with her? I’ve seen mixed reviews on Facebook and she would always tell me that her paypal “wasn’t working.” I ordered twice from her and received everything however the wait was really long 6-8 weeks. I would recommend ordering from someone in the States instead to be on the safe side. The pricing isn’t that different. I saw a lot of people sell the same outfit at Fresno Hmong New Year too.